Sarajevo is the capital of Bosnia-Herzegovina and is the focal point for most of the nation’s cultural and urban activities. It is surrounded by the Dinaric Alps and sits upon the Miljacka River. Although much of the city center is quite flat, Sarajevo is surrounded by hilly neighborhoods. Some of these are amongst the oldest regions of Sarajevo. Sarajevo is affected by both the continental European climate from the North, and the Mediterranean climate from the South. The city’s postcard-perfect winters contributed greatly to the selection of Sarajevo as the site of the 1984 Winter Olympics. The coldest month of the year is January, which is the only month of the year that typically reaches below 0° C (32° F). July is usually the warmest month and provides excellent weather for summer activities as well. 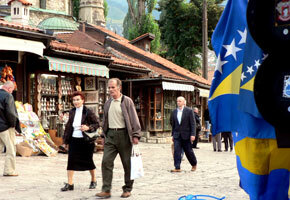 Sarajevo is rich in cultural and religious diversity. Longstanding traditions in Catholicism, Islam, Eastern Orthodoxy and Judaism blend together to make the city arguably the most eclectic cultural mix of all the capitals of Europe. The toll of the cathedral bells and the distinct sound of the calls to prayer from the mosques add to the overall experience, making it easy to feel that you have slipped back centuries in the past. While the history of the city has roots all the way back to the prehistoric period, today’s Sarajevo is in many ways defined by the occupation by the Ottomans in 1461. A cluster of small villages transformed into a fledgling city with a mosque, a marketplace, a hostel, and the governor’s palace. The governor’s palace, known as a Saray in Turkish, is of special importance as it is Saray Ovasi (the fields around the governor’s palace) which gives Sarajevo its name. Sarajevo grew quickly and by the mid-1600s the population had swelled to about 80,000. At the height of the population boom, it became the second largest in the Ottoman Empire. At the end of the 17th century tragedy struck and almost the entirety of Sarajevo was burned to the ground. Only a handful of smaller boroughs, an orthodox church, and a few mosques survived. For the next 100 years, a series of other fires ravaged the city as well. Bosnia was occupied by Austria-Hungary in 1878 and was soon assimilated into the Austro-Hungarian empire. Much of the architecture in Sarajevo’s city center still reflects this. Several of the buildings that form the skyline along the river Miljacka are strongly reminiscent of those found in Vienna. Already no stranger to tragedy, much the 20th Century was particularly harsh for Sarajevo. The city suffered through three wars — World War I and II, as well as the conflicts and siege of the ’90s. Although much of the city was in ruins at the close of the millennium, an intensive effort to rebuild the city has transformed Sarajevo once again into one of the jewels of Europe, with little to hint at the previous destruction in the city’s center. Sarajevo has a small international airport with regular flights from a number of European capitals. It is serviced by several European airlines including JAT Airlines, Alitalia, Lufthansa, Croatia Airlines, Czech Airlines and Bosnia’s own national carrier, BH Airlines. As there are currently no direct flights to Sarajevo form North America, air travelers to Bosnia & Herzegovina from the United States and Canada need to make at least one stop elsewhere on the continent. You can easily get to Sarajevo by train from Budapest, Zagreb, Ploce, and Mostar. The city is also accessible by major bus lines from numerous destinations. Sarajevo has two major bus stations, one of which is in a suburb of Sarajevo and is easily accessible to the city center by taxi. Sarajevo itself has a well-developed transportation network of buses and trams. You can buy a ticket from one of the tram drivers or from a kiosk located near major stops. Taxis are readily available as well and are reasonably priced. If driving around Sarajevo and the surrounding regions, be wary of the steep mountain roads, many of which are dirt, and of asphalt roads in disrepair. Keep in mind that names of towns around Sarajevo have been changed significantly in the past decade, and traveling outside of Sarajevo can get confusing. Fortunately, Sarajevo and the major nearby towns surrounding it are connected by well-traveled roads.